The two senses that are fully developed in the dog at birth are touch and taste. Dogs have about 1700 taste buds on their tongue, while humans have about 9000. This does not mean that dogs don’t get as much enjoyment from their food as humans. Just as in humans the sense of flavor is the result of both taste and smell. Humans have about 5 million scent receptors while dogs average about 220 million. A dog’s choice of foods first is based on the smell, then texture, and taste. Dogs can have a preference for a certain size and texture of foods. While we cannot fully appreciate how dogs experience the world, I think it is safe to say not even your dog wishes to eat the same food at every meal for months or years. Unless dictated by a specific health requirement it would be thoughtful to not feed your dog the same boring food all the time considering your dog’s sophisticated nose that allows her to appreciate the scent of each individual ingredient. Variety can also serve a practical purpose for your dog which is covered below. Many believe their dog enjoys its food because they quickly inhale the same food for years and eats it in record time. In reality it may be that he is not so much enjoying his food, as much as he is eating everything as fast as he can because he doesn’t want to go hungry nor does he understand there is not a food shortage. This behavior can be developed before 8-weeks of age and is often learned due to how they were fed. It would be far better they learned at an early age that there is no reason to eat like a vacuum, be defensive, or guard your food bowl. Adult dogs can do well on one meal a day but there are more advantages then trying to minimize bloat to feeding them twice a day. In addition to reducing hunger between meals especially when you are eating in front of them, one of the best reasons to feed your dog twice a day is that it gives you one more opportunity to provide them with something of value provided that you are feeding them something they enjoy. Free feeding is leaving a food bowl filled with a surplus of food available for the dog all day. (For health reasons this is not recommended) Two possible problems with this type of unregulated feeding is first it requires the dog to self-regulate the amount of food it eats. Second you likely will not notice a change in the amount of food your dog is eating or other problems your dog encounters during eating as soon as you would with scheduled feedings. (lack of hunger, tooth problems causing pain which limits the amount of food the dog will eat, etc…) This could result in the delay of a medical diagnosis. There is no shortage of choices when it comes to feeding your dog, nor is there a shortage of opinions on the food we should be feeding. Our understanding of nutrition is always subject to change as new discoveries are made. The information contained here has been obtained from a variety of sources. Noted here are many of the things I take into consideration when evaluating dog food for healthy dogs. Each dog is an individual and the information here is not meant to be complete or appropriate for all dogs. Pet owners have two primary options with regards to what they feed their pets. They can feed a home prepared food, or purchase a commercially prepared food for their pets. Which of these options is best to feed is dependent on who is providing the answers. Some will say to feed a food that meets minimum standards according to the Association of American Feed Control Officials (AAFCO) which has established the minimum nutrient levels (Nutritional Adequacy) that are used as a standard for dog and cat food. 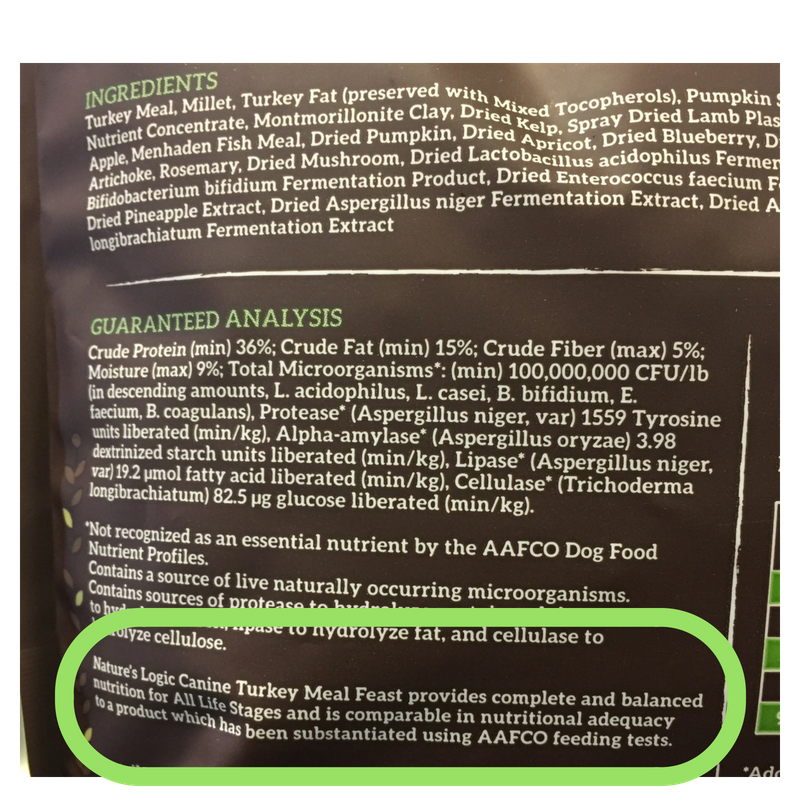 "Nutritional Adequacy statement" (AAFCO statement) Almost every pet food label will state the food is formulated to meet the minimum nutritional levels established by AAFCO from low quality foods to premium expensive foods. The question is do we wish to feed an adequate food or choose optimal nutrition. Others go further and say “that the ingredient list is one of the most useless aspects of the pet food label!” In addition to the nutritional adequacy statement they state even more important is whether the manufacturer employs ““at least” one “full-time” qualified nutritionist”, and that the manufacturer own the plant(s) where their food is manufactured. You will also be advised to stay away from raw or fresh foods. After reviewing the history of contaminated foods, seriously ill dogs, deaths, and pet food recalls from large and small companies with and without a nutritionist employed full-time I would not make my decision based on those recommendations. There are professionals who recommend a vegetarian diet for dogs. At the other end of the spectrum is animal nutritionist Dr. Richard Patton and many others who advocate for a balanced raw diet or home cooked foods and to avoid dry kibble due to high soluble carbohydrates. This is especially important for dogs battling cancer since carbohydrates will feed cancer. “Most commercial pet foods are based on high-glycemic, genetically engineered (GE) corn, wheat, rice or potato — grains and starches that have no place in your pet's diet, creating metabolically stressful insulin, glucagon and cortisol spikes throughout the day. To compare costs of differing foods you will need to first determine the number of calories your dog needs each day. Start by looking at the amount of food they are currently eating to determine the calories. Most commercial pet foods list the calorie content on the label. Calories on pet foods are generally listed as “kcal” which is the same as a “calorie” on human food labels. Calories will usually be listed as kcal/kg which the number of calories per kg which is 2.2lbs. (e.g. 3678 kcal/kg) Additionally calories will be noted for calories per cup (419kcal/cup), or for fresh frozen per oz (8 oz. : 422 kcal/patty) Like people all dogs are different and will have differing calorie needs. The feeding guides on pet food labels are just a starting point and the recommendations may not be appropriate for your dog. With dry food determining the cost to feed per day and how long a bag of dry food will last can be a bit complicated because dry foods have differing densities and weights. The typical dry food is close to 4 oz per cup and has about 4 cups per pound. But foods can vary widely. One food can have close to 3 oz a cup (5 ¼ cups/lb) and another about 5 ¾ oz a cup (2 ¾ cups/lb). With the Pet Food Math Cheat Sheet you can determine the ounces per cup and cups per pound of food using the calorie content of the food. You can always make your own pet food by following directions from a nutritionist or veterinarian. Professionals will often caution pet owners on preparing home prepared foods due to the risk of illness resulting from salmonella. Healthy dogs are resistant to the effects of salmonella infection. In fact salmonella is present in the digestive tracts of many dogs. Handling raw foods while preparing meals for your pets is really no more risk than handling raw food for humans. Whether preparing food for humans or animals it is recommended to thoroughly wash your hands and clean all surfaces that have come into contact with raw meat or pet foods. Many professionals recommend against pet owners preparing their dogs meals due to nutritional imbalances that can occur. Books like the “Small Animal Clinical Nutrition” recommend feeding a commercially prepared food for consistency and better nutritional balance. But after stating all the challenges of formulating a home prepared food for your dog even this book concedes it is possible to make nutrient balanced food for your dog at home and it provides recipes to make complete and balanced meals for both dogs and cats. The book lists homemade recipes for healthy dogs and cats, and recipes for those suffering with a urinary, gastrointestinal, heart disease, kidney disease, or just overweight issues. No one food or diet is great for every dog. Dogs can thrive on a raw or home-cooked diets. The key is that home prepared meals need to have the proper ingredients in the proper ratios to include vitamins and minerals for the food to be nutritionally complete. If you include vegetables in home prepared foods lightly cooking them can increase digestibility, but cooking too long may increase vitamin loss. When adding vitamin and mineral supplements they can be destroyed by heat so they should be kept separate from the food and not added until just before serving. “Many (and I would say most) homemade and prey-model diets and even some commercially available raw diets are nutritionally unbalanced. This can cause dogs to become deficient in antioxidants, or the correct amounts of trace minerals and vitamins, or the right fatty acid balance for appropriate and balanced skeletal growth, and organ and immune health. Just because nutritional deficiencies aren't obvious in your dog doesn't mean they don't exist. Although fresh meat is a good source of protein and some minerals, it doesn't represent a balanced diet. Wild canines eat nearly all the parts of their prey, including small bones, internal organs, blood, brain, glands, hair, skin, teeth, eyes, tongue and other tasty treats. Many of these parts of prey animals provide important nutrients, and in fact, this is how carnivores in the wild nutritionally balance their diets. Can my dog eat this diet while on chemo or radiation? Dog and cat foods will have on the label a “Guaranteed Analysis” and a “Nutritional Adequacy Statement” which will indicate what type of pet and what stage of life the product is suited for. Start with the “Nutritional Adequacy Statement” which will state whether the food is “Complete and Balanced”. A food that is “Complete and Balanced” for “All Life Stages” is designed to meet adequate nutritional levels established by the AAFCO for pregnant dogs, nursing dogs, growing puppies, and mature dogs. A food “Complete and Balanced” for “Adult Maintenance” is designed to meet the nutritional levels for adult dogs but not pregnant, nursing dogs, or puppies. It the label states the food “is intended for intermittent or supplemental feeding only” it does not contain the necessary vitamins and minerals to provide complete nutrition so it is not “Complete and Balanced”. The “Nutritional Adequacy Statement” is determined in one of two ways. This can be accomplished generally with either feeding trails or formulating a food to meet the nutrient profiles established by AAFCO for nutritional adequacy. Dr. Laurie Coger has written an excellent article on feeding trials here: WHEN IS A TEST NOT A TEST! Knowledge of nutrition is always growing and research supports feeding large breed puppies a reduced calorie and calcium diet (comparatively speaking) to support a moderate, and not maximal rate of growth. Choose a food formulated for large breed puppies "Brand X "Puppy Large Breed is formulated to meet the nutritional levels established by the AAFCO Dog Food Nutrient Profiles for All Life Stages, including for growth of large size dogs (70 lb or more as an adult)." It is recommended that large breed puppies maintain a "body condition score" (BCS) of 4 on a 9 point scale. With large breed puppies I highly recommend you work with a nutritionist to help evaluate any food you feed. Is the food working for growing puppies and dog? Stool (Poop) is moist and firm, and has a mild odor. If your dog is sensitive to food changes, change gradually over one or even two weeks. Slowly blend in the new food and replace the same quantify of the old food each time. Changing foods gradually will provide the digestive tract time to adjust to a different food. Once you have selected a category of food you can afford to feed and determined it’s appropriate for your dog’s life stage, check out the ingredients. Whether you are feeding a raw, canned, or a dry dog food, look for quality ingredients. Start by avoiding the ingredients on the "Ingredient To Avoid" list. Be wary of commercial pet food that lists ingredients in generic terms like, meat (mystery meats), animal or poultry by-products. Look for named sources such as; lamb, turkey, beef, chicken, etc… or dehydrated chicken, dehydrated beef, lamb meal, turkey meal, beef meal, chicken meal, etc. A named animal protein generally indicates a higher quality product than generic meats or plant-source proteins. I'm neither a nutritionist nor a veterinarian; I'm a dog owner and trainer who read’s labels and the ingredient list. On the puppy and adult food ingredient labels below "Apples, Broccoli, Carrots, Cranberries, Green Peas" are located at the bottom of the ingredient list more than twenty places below salt. It would appear these were added for marketing reasons not for any real nutrition in these amounts. Interesting to note, both these foods are manufactured by a large pet food company that employs multiple veterinarians and nutritionists. I’m not a nutritionist but I will make the leap and say I think the ingredients in these amounts are less than a few grams per pound of food and are contributing no measurable nutrients. I would call this “fairy dust”. And expensive “fairy dust” at that! PUPPY FOOD - IT APPEARS THESE WERE ADDED FOR MARKETING REASONS NOT FOR ANY REAL NUTRITION IN THESES AMOUNTS. ADULT DOG FOOD - IT APPEARS THESE WERE ADDED FOR MARKETING REASONS NOT FOR ANY REAL NUTRITION IN THESES AMOUNTS. The U.S. Food and Drug Administration has issued an alert about reports of canine dilated cardiomyopathy (DCM) in dogs eating pet foods containing peas, lentils, other legume seeds, or potatoes as main ingredients. “These reports are unusual because DCM is occurring in breeds not typically genetically prone to the disease.” DCM is a disease of the heart muscle and results in an enlarged heart that often results in congestive heart failure. “Taurine deficiency is well-documented as potentially leading to DCM.” This was a problem with cats in the 1980s. Cats require taurine in their food and it is considered essential in their diet. Taurine has not been considered essential for dogs since they can synthesize taurine from the amino acids cysteine and methionine. The FDA issued their alert after a significant number of dogs developed DCM that were on foods containing high levels of peas, lentils, legumes, or potatoes. These dogs were found to have low levels of taurine in their blood. The exact cause is not known and is currently being studied. It may be that certain dogs have a higher requirement for taurine in their diets. The cause may be low or poor quality proteins in the diet, or be caused by ingredient interactions. DCM in dogs has been studied for years although the cause is not certain there have been low taurine levels in dogs that are associated with lamb meal and rice foods, rice bran, cellulose, beet pulp, and high fiber diets. FDA needs pet food producers to report on any changes in ingredients, processing or formulation. I would not be feeding any foods containing peas, lentils, other legume seeds, or potatoes that are listed in the first 5 ingredients. Dogs have “no minimum dietary requirement for simple carbohydrates or starches”  and “do not need carbohydrates, as long as they are eating a high protein diet.” (Protein covered below) The standard dry dog food (kibble) requires starch (carbohydrates) which is processed into uniform pieces of kibble through a process call extrusion using heat and high pressure to make essentially an air-popped kibble. Much the same way human cereals and other high starch products are made. The dry kibble is than sprayed with fats and other flavoring to make the food palatable. As noted above the goal would be to avoid dry kibble due to high soluble carbohydrates (starch). The majority of dry kibble dog foods have between 30-50% or more of the calories coming from carbohydrates which is high. Pet food formulator Steve Brown states that the gold standard for carbohydrates would be 6% of the calories would come from carbohydrates. Note that the percentage of calories is not the same as the "guaranteed analysis" %. You can use the Pet Food Math Cheat to determine the percentage of calories from carbohydrates, fat, and protein. My goal is to choose foods that derived their nutrition from whole foods and natural ingredients. I prefer to avoid foods that add synthetic vitamins like menadione sodium bisulfite a synthetic vitamin K, and synthetic amino acids like DL-Methionine, L-Lysine, L-Carnitine, and Taurine. “Poor quality proteins can lead to profound nutritive failure, accompanied by a rapid decline in weight, loss of appetite”  Companies will make claims that their foods are highly digestible or have superior digestibility but these claims are meaningless without being backed by an actual measure reflecting digestibility in percentage points. Highly digestible food will produce well-formed, firm feces and low feces volume. With a quality food your dog should not defecate (poop) more than the number of feeding per day. Additionally foods low in digestibility can be the cause of gas (flatulence), loose stools, and occasionally diarrhea. Low cost foods may reflect the low-quality ingredients that are used. 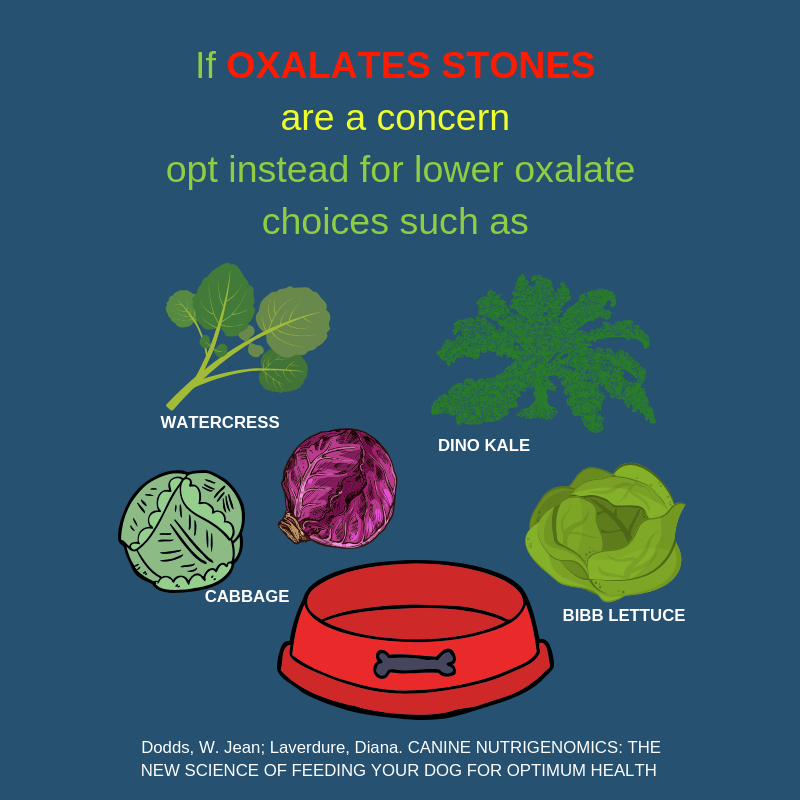 Poor quality foods that are low in digestibility will require the dog to eat more to get the nutrition it needs. Pet food formulator Steve Brown states that the gold standard is 49% of the calories would come from protein. Dr. Richard Patton states you need at minimum 18% protein on a dry matter basis, and there is no need to go beyond 50-60%. Note that dry matter basis and the percentage of calories is not the same as the "guaranteed analysis" %. We will show you how to determine the percentage of calories later with the Pet Food Math Cheat Sheet. Fats provide needed energy (calories) for dogs but it should also provide a good balance of fatty acids beneficial to dogs. Balanced fats are comprised of saturated fats (30-40% of total fat), monounsaturated fats, polyunsaturated fats, omega-6, omega-3’s, LA/ALA, EPA & DHA. Fats should be in the proper balance and proportion to protein and carbohydrates. Whereas endurance sled dogs in extreme racing conditions will consume over 10,000 calories and day on a high fat diet, the average dog will be better served on a diet with far fewer calories and fat. Pet food formulator Steve Brown states that the gold standard is 44% of the calories would come from fat. We will show you how to determine the percentage of calories later with the Pet Food Math Cheat Sheet. The problem with dry dog and cat foods are the high carbohydrates. Many veterinarians and nutritionist recommend if your dog or cat is overweight cut the carbs! "Calorie restriction—but not protein restriction should be pursued in overweight animals to achieve a slow rate of weight loss of 0.5% to 1% weekly." ... "Diets high in protein appear superior to those with moderate amounts of protein"
Using the gold standard pet food formulator Steve Brown recommends carbohydrates would be 6% of calories. 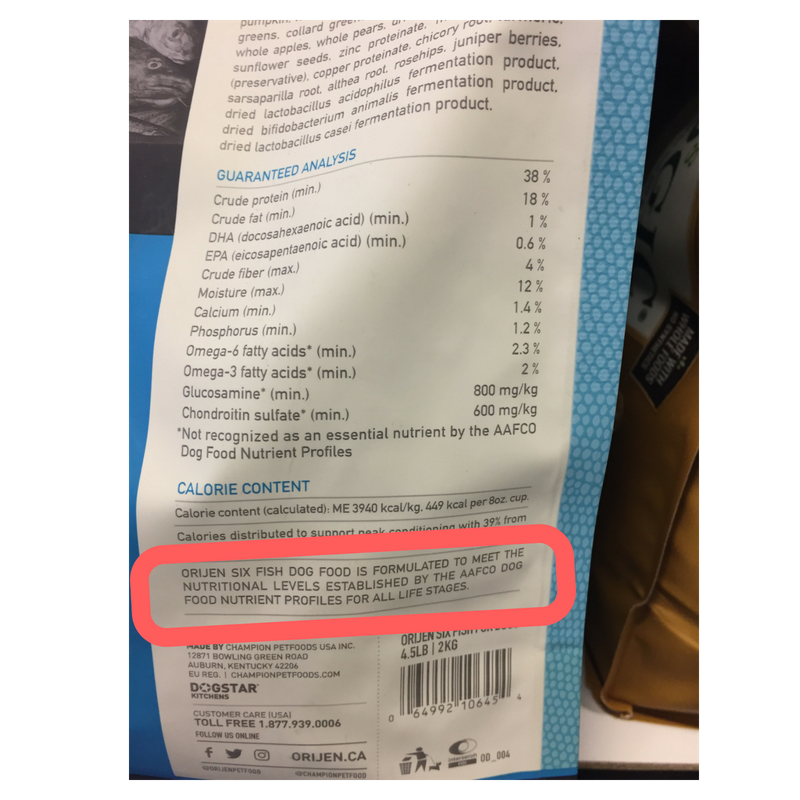 (Dry kibble ranges from 20% to 60%+) The ideal remaining calorie breakdown would be 49% of the calories would come from protein, and 44% from fat. Remember that the percentage of calories is not the same as the "guaranteed analysis" %. We will show you how to determine the percentage of calories later with the Pet Food Math Cheat Sheet. One challenge when searching for dog food for a dog with a moderate activity level is finding one that has a percentage of fat that is no more than 50% of the protein listed. Higher fat diets are a great energy source for active dogs but most dogs will get more calories than they can burn on a high fat diet. For dogs that are overweight I avoid foods marketed for the “less active” dogs. If you checked the label you may find that this food has the same calories or more than the food you are feeding now. Many of these foods contain a high fiber content which can reduce the overall digestibility and insoluble fiber like cellulose can reduce mineral adsorption. “A dry food that reports a crude fiber content that is higher than 5 or 6% has added fiber.”  High fiber can lead to increased need to defecate and a larger volume of feces. Instead I would limit treats and slightly reduce the amount of food feed, and increase their daily exercise. There’s an old saying, if your dog is fat you’re not getting enough exercise! If your dog or cat has itchy skin, diarrhea, gas, irritable bowel syndrome or inflammatory bowel disease your dog or cat likely has a food sensitivity or intolerance. Does your dog lick obsessively? It may be due to a food sensitivity or intolerance. Having been down this road more than once the first place I start is with a food intolerance/sensitivity test by NutriScan since food intolerance/sensitivity it is more common than a food allergy. NutriScan helped eliminate the guesswork without putting my dogs through weeks/months of food trails and continually going to the vet to manage symptoms. Does your dog eat grass regularly? Some grass eating is normal but excessive grass eating can be due to illness or gastrointestinal issue like a food intolerance. After running a NutriScan food intolerance test on each of my own dogs and then eliminating several foods from their diet their grass eating reduced about 95%. Food intolerances/sensitivities can build up over time with exposure to offending ingredient(s). Rotating foods every two to three months can do more then add to our dog's enjoyment of his food, it may help to avoid the development of particular food sensitivity and food allergies. The greater the length of time and frequency a particular food is consumed the greater likelihood an intolerance/sensitivity can develop over time. Allergy reactions show up in allergy blood test as antibodies (IgE and IgG), but food sensitivity & intolerances are tested with a dog’s saliva for a differing set of antibodies (IgA and IgM). With the NutriScan kit you collect saliva with a small cotton dental rope. You can do this at home or at the vet’s office. Then ship the kit back to Hemopet for testing. AVOID foods containing glutamate and aspartate. Glutamate and aspartate are two excitatory non-essential amino acids. If Your Dog Stops Eating! If your dog or cats stops eating the food you have been feeding don't add or mix in anything to make the food more appetizing. They may have refused to eat due to an infestation of mites, or the presence of bacteria, mold, or rancid fats. Improper food storage can result in bacteria and mold growth, and fats going rancid. Consuming this food can contribute to chronic health problems. Offer your dog something else to eat. If they eat the new food you offered, there may be a problem with the food you've been feeding. If your dog is refusing something else tasty you offered, they may not be feeling well. For a healthy adult dog there is no harm in them fasting, in fact it is recommended by many veterinarians. But if you have a puppy, diabetic dog, or senior dog contact your veterinarian. How to properly store dog food! The dogs I share my life with are companion dog's. "'Companion' comes from 'panis', the Latin word for bread. Originally, the word was used to describe someone with whom you shared a meal." I share almost everything I eat with my dogs' as long as it is safe and they do not have a food intolerance / sensitivity to it. Since I adopted them I treat them like family. Dogs are not our peers, but we should be their best friend. "The occasional feeding of table foods should not be of concern for healthy pets unless the food composes more than 10% of the daily dry matter intake"  "Dry matter" can be determined with the Pet Food Math Cheat Sheet. Dr. Karen Shaw Becker integrative wellness veterinarian dispels the long-held myth that "table food" is bad for your pets. Royal Canin, IAMS, and Eukanuba all make breeds specific foods for dogs as small as Chihuahua’s to German Shepherds. The big question is does it matter? Reviewing the three companies Chihuahua dog foods show similar ingredients in differing quantities. One thing it appears all three have in common is that they appear to be low on meat protein since all three foods have listed at least one synthetic amino acid in the ingredients. Nor do all three foods match with regards to the “Guaranteed Analysis” with respect to a minimum level of protein, fat, and fiber. The calories range from 323 up to 407 per cup. It is similar for the Labrador Retriever foods. All three appear to be low on meat protein; one has added taurine and L-carnitine, and another has DL-Methionime, and L-Carnitine, with the third listing L-Lysine, L-Tryptophan, and DL-Methionime. Nor do any of the three match on minimums for protein (23%, 25%, & 28%), or fat. The calories range from 276 - 348 per cup. It is frequently recommended to feed a variety of proteins and brands of foods and to rotate them often for several reasons. Dogs fed the same food over time are more likely to develop particular food sensitivity and food allergies. If a food is imbalanced, has an excess of a nutrient, or is deficient in an ingredient, rotating foods will limit long term exposure. Your dog will likely enjoy variety. The goal is to rotate and feed a variety of differing proteins and brands of food over time to help correct for any excesses, insufficiencies, or imbalances. Select several quality foods with a with a similar protein, fat, and calorie content to compare and make a decision on what to feed. With the Pet Food Math Cheat Sheet you can run the math to analyze and compare any type of pet food. Dry kibble, canned food, baked kibble, freeze-dried, raw, etc. You can get a copy of the Pet Food Math Cheat Sheet here. We cannot compare foods based on the "Guaranteed Analysis" alone since these numbers do not represent the full nutrient profile of the food. Differing types of foods (dry, canned, dehydrated, raw, etc…) have different amounts of moisture (water) so they will have great differences in the percentage of protein and fat listed on the label. Just subtracting the moisture content and comparing foods on a dry matter basis is not sufficient. Two foods with the same moisture content, and percentage of protein can provide differing amounts of total protein. To compare foods we need to know what percentage of calories come from protein, fat, and carbohydrates, and how many grams (g) of protein per 1,000 calories the food provides. To determine this we need to run the math using the "Guaranteed Analysis" and the "Calorie Content". Just enter the information from the "Guaranteed Analysis" and the "Calorie Content" on the food label and the cheat sheet will do the math so you can compare any type of food. Don't worry the Pet Food Math Cheat Sheet that will do the math for you. Since the goal is to rotate and feed a variety of differing proteins and brands of food over time to help correct for any excesses, insufficiencies, or imbalances. Select several quality foods with a similar protein, fat, fiber, and calorie content to compare and make a decision on what to feed. With the Pet Food Math Cheat Sheet you can run the math to analyze and compare any type of pet food. Dry kibble, canned food, baked kibble, freeze-dried, raw, etc. Get your copy of the Pet Food Math Cheat Sheet here. “No One Method Is Best for Feeding Dogs or Cats Pets can flourish eating just about any foods (with a few caveats). In mulling over this conclusion, we realize that we should not have been surprised to make this discovery. After all, we know perfectly well that humans grow, reproduce, and live to ripe old age on diets that differ enormously in what is considered normal and acceptable to eat. As long as the diet includes sufficient amounts of a variety of minimally processed foods—meat, dairy, fruit, vegetables, grains (or their substitutes)—the needs for essential nutrients and energy will be met. The same goes for dogs and cats. As we have said, it is extremely difficult to induce a nutrient deficiency in a person or animal eating enough of a variety of foods. This means that you have lots of options for feeding pets healthfully. You can choose a feeding method that not only meets the nutritional needs and preferences of your particular animal, but also—and we think this is an important consideration— one that fits comfortably with the way you live and with your personal dietary beliefs and preferences. If this concept seems as surprising to you as it did to us, it is because nobody would ever know this from surveying current books on how to care for pets. The books that are out there tend to cite every bit of research or experience they can muster to argue that you must feed your pet only one kind of diet—only commercial pet food, only one or another alternative pet food, only meat, only grains and vegetables, only raw foods, or only home-cooked foods. Humans don’t eat only one way. Pets don’t need to either. Any or all of those methods, singly or together, can promote excellent health in a dog or cat.” Nestle, Marion. Feed Your Pet Right: The Authoritative Guide to Feeding Your Dog and Cat). Atria Books. I'm not a nutritionist nor a veterinarian, I'm a dog owner and trainer who is working to do the best for my animals. After reviewing differing opinions on how to choose and what to feed I've come to the conclusion that i think its reasonable to read the ingredient list and I have not limited my choices to only the manufacturers who employs a full-time nutritionist, or just the ones who own their own plants where the food is manufactured. My goal is a low carb diet that includes sufficient amounts of a VARIETY of MINIMALLY processed foods! HOW TO MAKE THE FOOD YOU FEED BETTER! For cat food guidance CAT FOOD. My Healthy Dog, the hub for the canine nutrition courses created by global dog nutrition experts Dr. Jean Dodds and Diana Laverdure-Dunetz, MS. The self-paced online canine nutrition courses will enable you to take control of your dog's diet once and for all. From the basics of your dog's nutrient requirements to creating cooked or raw diets with confidence to selecting the absolute best commercial foods, you'll learn everything you need to know to ditch the doggy diet stress and ROCK your dog's diet! Proper nutrition is essential to a long, healthy life, so let's get started optimizing your dog's diet and health today. The Safety Reporting Portal (SRP) streamlines the process of reporting product safety issues to the Food & Drug Administration (FDA) and the National Institutes of Health (NIH). If you are looking for a list of recommended pet foods here are two that I recommend to use as a starting point. Evaluate each food recommendation for yourself and don’t accept any recommendations blindly. Whole Dog Journal https://www.whole-dog-journal.com/topics/dog_food.html List is available to subscribers. Case, Linda. Dog Food Logic - Making Smart Decisions For Your Dog In An Age Of Too Many Choices. Dogwise Publishing. Bisphenol A (BPA) in the serum of pet dogs following short-term consumption of canned dog food and potential health consequences of exposure to BPA.